The Wreck Monster crew is absolutely passionate about wrecking and dismantling Mercedes Benz and its models. We pay top cash for Mercedes Benz and all other sub models. If you wanted to upgrade your old Mercedes car, truck, SUV, van or Utes with the new ones, then give us a call at 0478 682 103 or fill up one of free quote electronic form on the website and get the estimation within 24 hours or sooner. If you are looking for the best place to sell your car in Sydney then you cannot ignore Wreck monster. We are buying scrap or junk European automobiles since 1985 throughout Australia and have a proven track record of paying the excellent money for your unwanted vehicles. 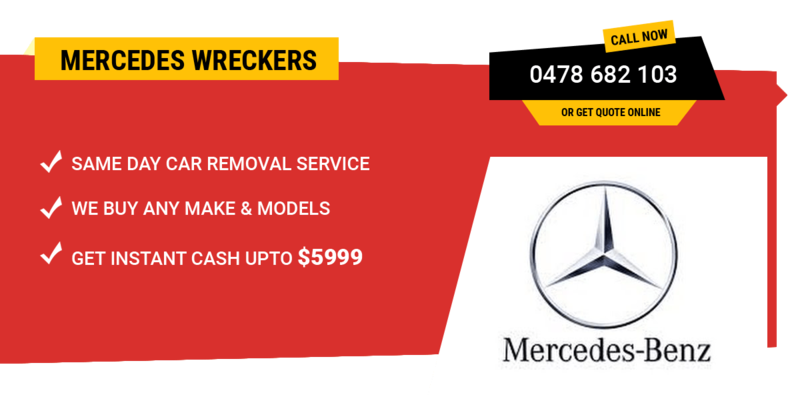 As a leading Sydney based scrap auto dismantlers, we buy all make and models of Mercedes Benz. We pay top cash for Mercedes Benz sprinter, 2000, 280 SE, A150, A200, B180, C Class, E240, S Class, SLK and much more. Check out the full list of Mercedes-Benz vehicles. At Wreck monster, we offer the free car removal service anywhere in Sydney and an immediate suburbs. In most of the cases, we try our best to offer the same day removals if you accept our cash offer. Our auto removal experts have the years of expertise to make the whole process easier and safer. We have been using the latest towing trucks and other equipment’s to meet the safety standards. As a responsive auto removal crew, we offer same day Mercedes removal in Sydney and offering free auto removals services in Campbelltown, Penrith, Greenacre, Blacktown, Richmond, Baulkham Hills, Liverpool, Ultimo, Parramatta, Botany, Smithfield, Villawood, Salt Ash and much more. Expecting a same day removal in Sydney, NSW? Please verify your location with us in advance because in some rural regions, it would be hard to operate within 24 hours or so. We are not sure about the other auto wreckers in Sydney, but we never twist our nose buying the vehicles of different make and models. Even if you are not sure about the brand you are keeping, we will take care of that. We collect broken, accidental, scrap, junk, rusty, unregistered, non-roadworthy for any reason, flood damaged, hail damaged, no WOF or COF or totalled vehicles. Just verify yours and vehicle’s identity and leave the rest of procedures for us. Get the top cash paid for Mercedes Benz models. We pay top cash in the Sydney suburbs. You can get the offer and compare with anyone and we are happy to beat all genuine offers if needed. We are certified Mercedes van, truck, 4×4, SUV and Ute wreckers who always pays maximum cash for all types of vehicles. The maximum amount that we can pay for the Mercedes can go up to $10,000, however, it depends on the age, and condition and the KM make of the vehicle. There are some other factors that we can explain you at the scrap yards. Feel free to get in touch and we can go from there. If you are worrying about the huge scrap or junk truck parked in your driveway and wondering how to get rid that off ASAP, then you need to consult Wreck Monster crew immediately. You can always get up to $10,000 cash for old trucks and free truck removal service anywhere in Sydney. We are committed to buying the scrap vehicles for the best price, dispose them safely and save the environment. Worried about the vehicle’s paperwork? Most of the people ignore to get rid of the Junkers because they don’t want to take the hassle of doing legal paperwork for them or other causes. However, we would like to heads up for those people and ready to look after all the paperwork hassles on their behalf. Our crew members deal with multiple vehicles every day and they know how to deal with it quickly and safely. At the top of wrecking and metal recycling services, we sell used Mercedes Benz car parts in Sydney. Our spare parts prices are affordable and quality is reliable. We are keeping the massive range of Mercedes parts and accessories that could be accessed online or by phone. We are happy to browse the required part and the price for you. All the auto parts and accessories are fully tested and selling with limited warranty. Generally, parts come from 30 to 90 days of warranty and it can vary based on the nature of the spare part. Book your desired auto parts now. We buy broken European vehicles for the good cause. We dismantle them and save the recycled parts and dispose the non-recyclable elements in a safe way. Finally, we do the metal recycling that helps many industries to produce the different products. We have dealt with thousands of happy customers through New South Wales. Our wrecking services are trustworthy and recommended by several people. Customer satisfaction is our first priority and we strive our best to fulfil this. If you are not happy with our cash for car services, feel free to let us know and we would be happy to work out the issue and try our best to get it resolved. Selling an old, scrap, junk or totalled Mercedes Benz in Sydney? Sell it off for the big bucks to Wreck Monster. Give us a call at 0478 682 103 or feel free fill an online form and get the quick quote now. Please explain about the vehicle as much as possible, including condition and VIN number if applicable. The more information you provide, it will help us to fetch out the best price for your vehicle.